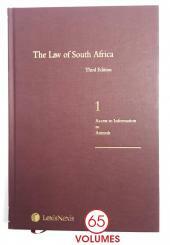 The Law of South Africa is an encyclopedic collection of South African law. It is the only work of its kind in South Africa. 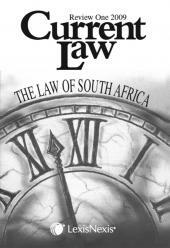 This reference work contains various topics on South African law and contains over 162 titles. Available in online and in print as 63 hard cover title volumes and a 2 volume Lawsa supplement. The online version is an ideal research solution. Lawsa is used as a starting point for legal research since it covers the law as it stands and makes reference to relevant legislation, case law, text books and journal articles. Written by a team of eminent jurists, academics and practitioners, this publication is widely used by judges, advocates, attorneys and legal academics. Now in its Third Edition, with new titles covering new legislation. Lawsa is kept up to date by Current Law and the Lawsa Cumulative Supplement.